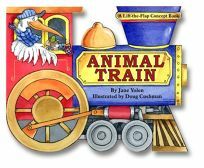 The animals aboard Jane Yolen's Animal Train, illus. by Doug Cushman, teach colors, shapes, numbers and opposites. Die-cut like a locomotive, the board book's playful verse encourages youngsters to look beneath liftable flaps (""Porter Seal soon/ Comes and goes,/ Luggage balanced/ On his nose"") as the characters ride the rails.